Appliance Repair - Chambers Services Inc.
Get the Best Appliance Repair in Town! 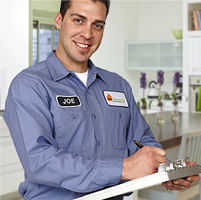 Chambers Services offers appliance repair, convenient scheduling windows, as well as 24-hour priority service. We handle appliance repair for all brands of major appliances, including KitchenAid, Bosch, Whirlpool, and more. Our service area includes Davenport IA, Moline IL, Rock Island IL, Bettendorf IA, Bloomington IL, Peoria IL, Pekin IL, Champaign IL, Lasalle-Peru IL, Springfield IL, Decatur IL, Galesburg IL, Quad Cities, and the surrounding area. Our service includes a one-year warranty on all parts used as well as a 90-day warranty on labor. Bulk parts buying gets you the lowest price. Technicians carry parts and tools on trucks. We strive to always be on time. We understand you may be leaving a job and want to get you back to work.